If London is to retain this commercial accolade all agree that a way has to be found to accommodate runway expansion. 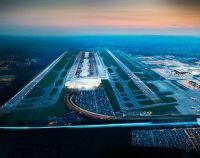 This was confirmed in December when the Government appointed the Airport Commission, chaired by former Financial Services Authority chief Sir Howard Davies, who shortlisted Heathrow and Gatwick airports as possible sites for a new runway by 2030. The estuary airport plan, favoured by London Mayor Boris Johnson, failed to make the shortlist. However, in what was clearly an item of political expediency, the Commission promised to look further at the scheme and has announced an “Inner Thames Estuary feasibility study”. Addressing the conference Sir Howard said that the estuary scheme, costing as much as £112bn, presented "many challenges and risks", adding that the cost looked "rather daunting". The construction challenge in building a new estuary airport would be "massive.” His idea of costs differed somewhat from Huw Thomas, a smooth talking member of the Lord Foster architectural partnership, advocating the Isle of Grain scheme, who came in with a figure of £18m, just for the airport, in a later presentation. 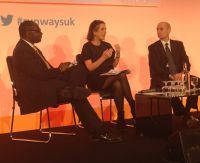 London First Chief Executive Baroness Jo Valentine was on the stage after Sir Howard Davies giving a perspective on the short-term wins that would really help, ahead of actually building runways. She talked about the importance of an independent noise regulator as well as getting on with improving links to Stansted. The fireworks then began when the Mayor’s aviation adviser Daniel Moylan launched a scathing attack on what is an independent body tasked with identifying the location of the UK’s next runway. Mr Moylan said: “The commission’s interim report bafflingly states, in the face of the evidence that it has itself assembled, that ‘the UK does not face an immediate capacity crisis’ and that a single extra runway in the southeast will be sufficient by 2030. He said the UK needed a four-runway hub and Heathrow was not the answer because “it is too toxic for any government to deliver”. He talked more about using the airport as an economic and social instrument rather than providing capacity where demand is greatest. Mr Moylan said that the Commission was intent on “securing the worst possible outcome for the capital, that is an additional runway at Heathrow, which will inevitably be followed by a fourth”. The Mayor's alternative preference, for expansion at Stansted, had been dismissed for "flimsy reasons". Whilst the great majority of the audience did not agree with Mr Moylan it was also evident that Gatwick and Heathrow are technically full. What is going to happen in the intervening years? Dr Ralf Speth, the Chief Executive of Jaguar Land Rover, accused the government-backed body of giving a “lack of priority” to regional airports, which are often closer to Britain’s manufacturing bases. 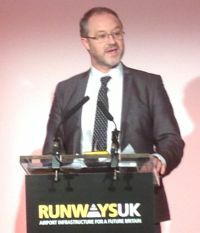 Colin Matthews, Heathrow CEO, highlighted new research from independent polling company Populus. The study suggests that far from being politically impossible, supporting a third runway at Heathrow could actually be a vote winner for local MPs. 48% of residents said they supported expanding Heathrow, while 36% were opposed. Steward Wingate, Gatwick CEO, spoke in the same session as Colin Matthews. He was clearly pleased with the Commission's interim review and pointed out that his airport had the support of the local community and West Sussex County Council. Cost-wise Gatwick is the cheapest option but questions from the floor indicated that the airlines still very much prefer Heathrow. 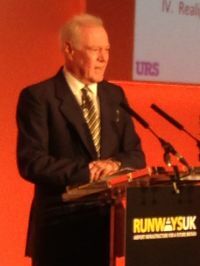 Jock Lowe, British Airways former Concorde chief, was also given a platform to elaborate on his runway extension scheme “The Heathrow Hub”. He proved to be a fine advocate for the project which involves doubling the length of Heathrow’s northerly runway and building in a new rail and road interchange. On the question of noise his presentation showed the massive reduction of the footprint since the Boeing 707 to the current Boeing 787. Concorde of course was another story! If his ideas were not taken up he would back those of Heathrow Airport but said that if Gatwick got the first go-ahead he would “emigrate!” He also asked the audience to remember the White Elephant of Montreal Mirabel! Neither Mathews nor Wingate would give ground on the possibility of their airport being placed second. Both were very adamant. The best comments of the day were from Norwegian's Chief Executive Bjorn Kjos, "UK is the capital of Europe" and from IATA, Vice President Europe, Rafael Schvartzman "the UK has to bite the bullet as the need for new runways is obvious to IATA members and that the Heathrow option is the best location for their business". 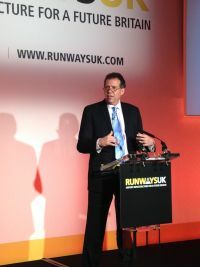 Andrew Haines, Chief Executive of the Civil Aviation Authority, gave an insight into the complexity of the airspace problems over London but steered clear of getting into any controversy regarding the recent CAA report on airport charges and securing UK regional links by legislation. At the conference this question of links into London were placed into a siding, with the CAA response and also a question to Colin Matthews by Business Travel News. As things stand, other than the current seven (as against 20 years back - could be six soon), there will be no air links to the capital for the next 15 years. HS2 was also in a siding as far as the conference was concerned. This was a little surprising but the organisers are to be complimented for cramming in a great deal into the day. Lord Adonis, Labour’s last Transport Secretary, has in the past urged the Davies Commission on airport expansion to make a strong economic case for additional runway capacity. He favoured a third runway at Heathrow whilst in office and said that the next government could duck a decision until 2020. He wanted the final recommendation to be made before next year's election, but admitted "that’s not going to happen, because the Prime Minister has made it clear that it’s not going to come before the summer of 2015”. He warned that opponents to the chosen scheme would make a “powerful argument” that no decision should be taken in advance before yet another election, because the voters had not been consulted. The Commission will report in the summer of 2015 but that report is only a recommendation. Will the government of the day support it, and will those who do not like what it says keep quiet? Based on Boris Johnson’s response to the interim offering this is very very, unlikely. Likewise others. On the positive side the Liberal Democrats may drop their long held opposition to any airport expansion in south-east, leader Nick Clegg has indicated. Labour did support Heathrow’s three runways until they lost the election. Most Conservative opinion seems in favour of expansion with the exception of the deposed Transport Minister Justine Greening, and wealthy Richmond Park MP Zak Goldsmith, both of whom were elected in constituencies with relatively little airport noise, and far fewer airport workers, but much media presence. 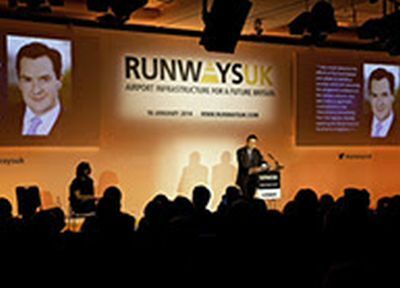 Runways UK says it will reconvene in 12 months time, but may hold other events in the regions. January 2015 will be pre-election.